As the two Koreas strive for conciliation, cooperation and peace, the European Union can lend its expertise, using its far-reaching diplomatic outreach, technical know-how and track record of rules-based engagement, according to a Korea chair based in Brussels. Ramon Pacheco Pardo, the Korea Foundation-Vrije Universiteit Brussel Korea chair at the Institute for European Studies, told The Korea Herald that the EU has pursued a policy of “critical engagement” with the North, using a carrot and stick approach in prodding the regime toward denuclearization and always preferring diplomacy over military action. Pyongyang has especially pursued reforming its real estate, agriculture and tourism, and promoted their developments, albeit under the watchful eyes of the state, the scholar added. Currently, European companies barely invest in or trade with North Korea due to international sanctions, he noted. Nevertheless, there are enterprises highly willing to engage in commerce with the communist regime, as an internationally open North Korean economy would present enormous opportunities. 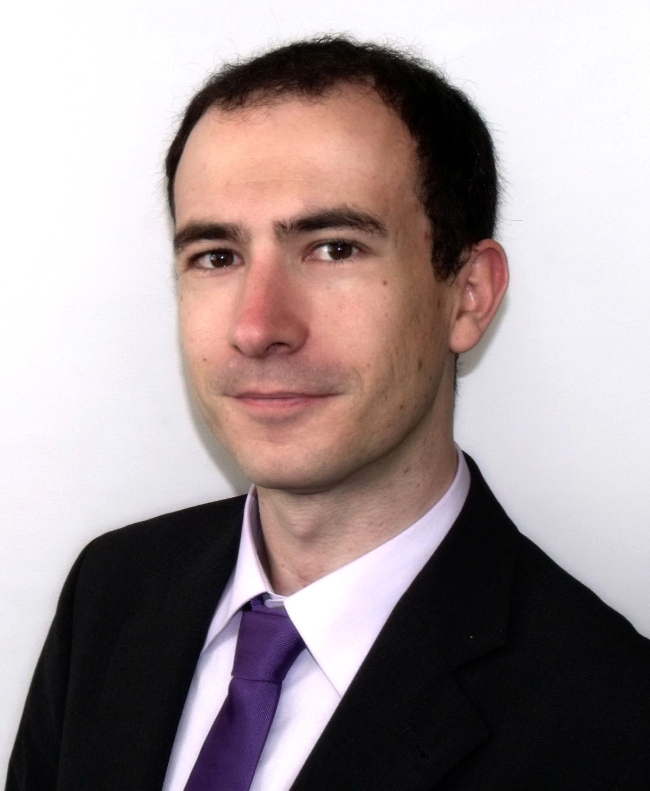 Pacheco Pardo is also a senior lecturer, or associate professor, of international relations at King’s College London. His chair position is one of the three funded by the Korea Foundation -- a public diplomacy institution under the South Korean Ministry of Foreign Affairs -- with the other two being held by Victor Cha at the Center for Strategic and International Studies and Jung Pak at the Brookings Institution. His duty is to conduct research, create and strengthen academic networks, and inform Europe on policy issues related to the Korean Peninsula, including the nuclear issue, trade and investment and social and cultural affairs. On facilitating the ongoing diplomacy related to Pyongyang’s denuclearization, European member states, many of which have embassies in Pyongyang, can act as honest brokers and provide venues for meetings and negotiations, the academic suggested. 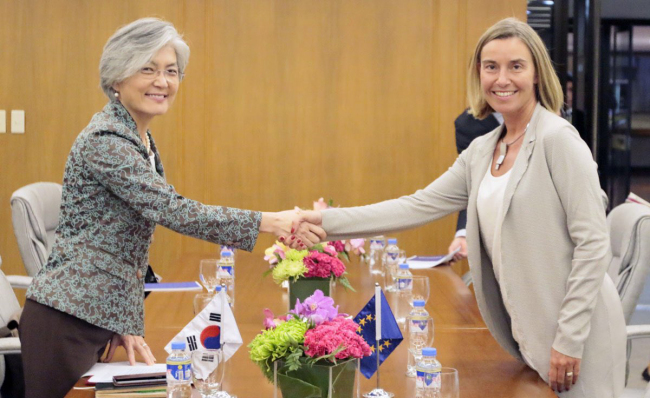 South Korean Foreign Minister Kang Kyung-wha (left) and Federica Mogherini, the European Union’s high representative for foreign affairs and security policy, shake hands before a meeting in Manila in August last year. The EU’s time-tested record of staying faithful to international agreements is noteworthy nowadays, Pacheco Pardo stressed, mentioning uncertainties surrounding the fate of the Iran nuclear deal. The United States under the administration of President Donald Trump has threatened to pull out of the international accord -- officially known as the Joint Comprehensive Plan of Action -- by the May 12 deadline. The deal was reached in Vienna on July 14, 2015 between Iran, China, France, Russia, the United Kingdom, the United States, Germany and the EU to put a cap on Tehran’s nuclear program. Technically, Trump must decide by May 12 whether to renew “waivers” suspending some American sanctions on Iran. “While we have expressed concerns related to other issues, such as the development of ballistic missiles and increasing tensions in the region, these issues are outside the scope of the nuclear agreement and will be addressed in the relevant formats and fora,” said Federica Mogherini, the EU high representative for foreign affairs and security policy, stressing that the lifting of sanctions has had positive impacts on relations between Iran and the international community. Pacheco Pardo pointed out the EU can also help facilitate the verification process of North Korea’s denuclearization process. That would involve the dismantling of the nuclear test site in Punggye-ri, the Yongbyon nuclear plant, and all other uranium-enrichment facilities, as well as providing unlimited access to these sites for international inspectors. To implement the “complete denuclearization” declared on the historic inter-Korean summit on April 27, which South Korean Unification Minister Cho Myong-gyun confirmed as “complete, verifiable, irreversible denuclearization,” Pyongyang must disclose all its nuclear weapons, fissile materials, facilities, technologies and researchers. “As the EU has been involved in Iran’s denuclearization, our technical expertise will be very useful to North Korea’s prospective denuclearization,” he said, noting that Pyongyang’s program is much more advanced than Iran’s and the geopolitical calculations are different. NATO and Seoul signed the Individual Partnership and Cooperation Program in September 2012, which encompasses political dialogue and technical collaboration in joint priority areas: counterterrorism, multinational peace-support operations, enhancement of interoperability and cooperation under NATO’s Science for Peace and Security Program. As Pyongyang and Seoul, alongside Washington and potentially Beijing -- all of them signatories to the armistice signed in 1953 -- work toward officially ending the 1950-53 Korean War by signing a peace treaty potentially within this year, confidence-building measures -- including tension-reducing steps and diplomatic, cultural and family exchanges -- would have to take place, the professor explained. The treaty would pave the way for an eventual peace regime on the Korean Peninsula. The EU has actively provided humanitarian aid to the poverty-stricken nation and will continue to do so, the academic said, working to strengthen the country’s food security and agriculture.